Practicing daily affirmations can be a powerful tool to bring change into one’s life. But for some people, it’s not as simple or as engaging to just sit still and repeat affirmations in their mind. Here’s a tip how to make affirmation practice more fun and engaging and therefore more effective. Take a piece of paper or open a page in your bulleted journal. Write down a thought or idea you’d like to focus on in the middle of the page and then draw a pattern around it thinking about your idea. Color the pattern with your favorite colors to bring it home. Patterns on the images below are based on TV Show “Extant” inspired coloring pattern. Practicing daily affirmations can be a powerful tool to bring change in one’s life. But for some people, it’s not as simple or as engaging to just sit still and repeat affirmations in their mind. Here’s one of the ways to make affirmation practice more fun and engaging and therefore more effective. Take a piece of paper or open a page in your bulleted journal. Write down a thought or idea you’d like to focus on in the middle of the page and then draw a pattern around it thinking about your idea. Color the pattern with your favourite colors to bring it home. Enjoy! 😊🎁 #dailyaffirmation #bujo #bulletjournal #thesecret #themasterkeysystem . 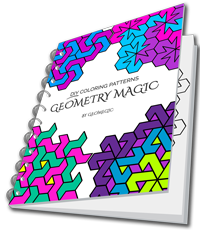 This pattern can be drawn on a square dot grid page or on rhombic dot grid page. Download these and other grid pages at https://geomegic.com/downloads/ . “I am whole, perfect, strong, powerful, loving, harmonious, and happy” is the phrase by Charles Haanel from the book “The Master Key System” that we also know from “The Secret” film/audio program.